My name's Thomas. I carry a whistle. I have been learning a lot of new skills lately: Nixtamalizing corn from the garden, sewing, leatherworking, and this one: Building arrows from scratch. This is a store-bought sitka spruce shaft with store-bought feathers, but it has something I've never tried before: A self-nock. 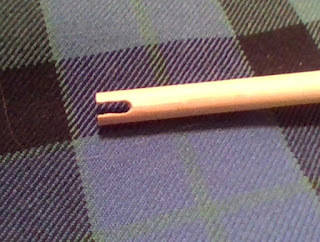 That means the little notch that goes on the string is carved into the wood itself, rather than a little piece of plastic glued on the end. I carved it out perpendicular to the grain with 4 mini-hacksaw blades taped together; finished with a 1/8" file and 140 grit sand paper. Wrapped with silk thread coated in Duco. I am having a devil of a time getting the cuts dead center on the shaft. I've been practicing on some old, broken POC shafts. This is the first one I've tried that might actually shoot. I plan on giving it a try tomorrow once the glue is all cured up. I hope I've done it right. I'm guessing an exploding arrow coming out of a 60# longbow isn't going to feel good. 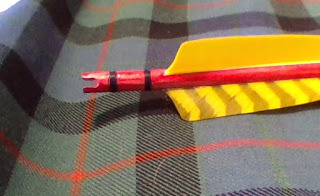 Once I master this, I'm going to try fletching with some raw turkey feathers. Then I'll try making my own shafts from chokecherry shoots. That's a ways off yet, but the direction I'm going. Hopefully by then, I'll be able to actually hit something with this new bow of mine. Edit: My second nock is a lot better, and went a lot faster. Progress! I often hear people say that God answers prayers one of four ways: Yes; No; Wait; and I've got something better. That sounds nice, and contains some truth, but scripture doesn't really articulate it that way. 1. Yes. I'll give this to you. Here you go. 2. You have my blessing. Now get to work and go get it. me redirect you and bring you closer to my will. enough faith to remain calm if things don't happen when I think they should. and it will be yours.” I no longer believe that this means, "When you pray for rain, bring your umbrella." already received? What promises, provisions, and blessings has Jesus already made available to me? just need to reach out and take them. better place to host my blog. Perhaps I should pray about it? His name was Lon. Looking back, he was a rather pathetic fifth grader with a big mouth who got a feeling of power by terrorizing younger kids. But at the time, he was the Lord of the Neighborhood. His word was law, and usually, his word was something frightening and humiliating. He was a Big Kid. And he had two big, dumb buddies to back him up. My dad didn't know about Lon when we made Jack O' Lantern Man. It was just a fun thing to do: Stuff a set of his coveralls, set the resulting body in a lawn chair, and put a pumpkin on top for a head. It was my dad's creativity and love of taking things a step further that made him prop the old car speaker up behind Jack's head, with a wire hooked in that led up to a microphone in our upstairs window. We could sit up there, in the dark, and give Jack a voice. To the little ones, his voice was friendly and happy. To the bigger kids, the ones who enjoy being scared just a bit, his voice was menacing (but still funny). It was a beautiful thing, good for lots of laughs, jumps, and Halloween cheer. Things had pretty much wrapped up for the night, and the porch light had just been turned off--the universally understood signal for "We're out of candy and we don't want any more trick-or-treaters"--when the three Big Kids came up the sidewalk. Even in the dark, I recognized Lon by his swagger, and his two buddies by their knuckles dragging on the ground. It was obvious that they were too cool to wear costumes, and they were just out causing trouble. And, in a brazen breech of small-town ethics, they ignored the darkened porch light and rang the door bell. Dad wanted to know, "Who are these clowns?" I told him this was Lon, and he and his buddies were not nice guys. I might have mentioned the fact that he was mean to younger kids. I might have, oh, possibly whispered a few details about how he had threatened to hurt me and my friends. Fatherly wisdom dictated no candy for such scum of the earth, so the doorbell went unanswered. Lon rang it again. And again. Jack's candle burned, casting an eerie, orange glow about the yard. Convinced that no one was home and the house was undefended, Lon began poking around, looking for some petty damage he could do, and his attention almost immediately turned to the jack o' lantern. Backed up by his smirking buddies, he strutted over to Jack, preparing with an exaggerated wind-up to knock Jack's head off. And at that moment, out of the darkness, in the thundering voice of my father...Jack spoke. YOU TOUCH ME AND I'LL RIP YOUR ARM OFF! I don't think, up to that moment, I had ever seen what utter terror looked like. Lon's eyes bugged out and his mouth gaped as he leaped several feet up and several yards backwards, landing flat on his back in the grass. Lon's Neanderthal buddies, who were standing several feet back and thus only mildly startled, immediately saw what had happened. The guffawing from the upstairs window might have tipped them off; I don't know. But in a moment, they were laughing too. At Lon. The Big Kid. Lon, of course, picked himself up immediately and feigned bored disdain for the whole thing, but the damage was done, the armor of Big Kid invincibility cracked. And somehow, the next day, all my friends at school knew what had happened. I guess that in a perfect world, Lon and I would have become friends. I can't say that happened--his scare sure didn't cure him of being a jerk. But I sure don't remember him seeming all that scary after that, or having quite so big a mouth. I guess it was a learning experience for both of us: A bully's humiliation was a scrawny third-grader's liberation. Today, I complete my forty-fifth trip around the sun. If the numbers pan out, I should be about halfway to the finish line of this race we call life. I'm happy to announce that some of the aid stations in this race have bacon. And I'm pretty sure I'm on my way to a PR. I've tried to keep my eyes open and pay attention along the way, and I have picked up a few lessons that I try to live by. Here are 45 of them--just one per year, because that's about as fast as life-lessons can penetrate my skull. 1. Determining the right thing is seldom complicated. Doing the right thing is seldom easy. 2. A person who will not ask for help in time of need is just as morally screwed-up as a person who will not offer it. 3. If you ever hear yourself saying, "God wants me to be happy," beware. God wants you to be faithful. The happiness will follow. 4. Here's the cure for boredom: Find something that needs done. Go to it. 5. There's really no point trying to change anybody but myself. 6. If you really want to fight for your family, quit fighting with your spouse. In the long run, peace is often more important than vindication, and winning is seldom worth the damage. 7. Depression is real, and it is true what they say about it: You cannot just "get over it;" you cannot just will it to go away. All you can do it fight it, with every spiritual, emotional, physical, and relational weapon that comes to hand. When that crushing, unreasoning despair comes down, just finding the courage to fight is a major victory. 8. Always accept when someone offers you a breath mint. 9. Being a Christian isn't about being right; it's about submitting to Jesus, because he is right. 10. There are very few obstacles in this world that cannot be cut down to size by love, hard work, and perseverance. 11. Make kids laugh whenever and however you can. 12. No matter how badly I want it to be otherwise, very few things are about me. The more I make peace with this truth, the happier I am. 13. "But" is one of the most powerful words in our language, and it gives its power to whatever comes after it. "I'm sorry, but..." is a pretty poor excuse for an apology. "This is hard, but..." are the words of someone on the verge of overcoming. Don't ever say "I love you, but..."
14. Act like a kid when you can. Act like a grown-up when you need to. 15. Sometimes God answers my prayer by changing the situation to suit me. Sometimes he changes me to suit the situation. 16. "The Golden Rule" doesn't go away when the other person is wrong; indeed, that is the only time it really becomes necessary. 17. If the person across from you admits that they were wrong, that doesn't necessarily mean that you were right. 18. The more important and complex the topic--politics, religion, parenthood, ethics, the environment, that sort of thing--the more important it becomes to approach it with calmness, open-mindedness, and humility. Bring your best spirit and your best thinking to these topics; approach them to learn, not merely to win; don't bother engaging with those who do not do likewise, especially if they agree with you. The implications are too big for anything less than your best. 19. Aging gracefully has a lot to do with learning one's limitations without being imprisoned by them. 20. The Bible tells us to confess our own sins, so that we may be healed. It's a whole lot easier to confess everybody else's sins. 21. No matter what you see in the movies, angry outbursts almost always make things worse, not better. 22. There is nothing that happens--Nothing--that God cannot redeem and turn into something beautiful, if we just trust him. 23. Gratitude is the great stabilizer of the soul: It contains the remedy for arrogance and shame, for laziness and perfectionism, for despair and over-confidence. Thankfulness brings humility without humiliation, contentment without apathy, confidence without pride, and great riches without greed. 24. There is always something to be thankful for. Always. 25. Don't be shocked and outraged when life is hard. It's supposed to be. If hard times take you by surprise, you haven't been paying attention. 26. If someone offends you, it probably isn't worth taking it all that seriously. 27. It takes great courage to love and serve in the face of injustice, heartbreak, pain, brokenness. Those who choose to do so are worthy of recognition and great respect. 28. Sometimes it's easy to ignore the acre of wild flowers and focus in on the dog turd over in the corner. 29. We cannot teach our children to be creative risk-takers by forcing their teachers to play it safe, teach to the test, and go with the flow. 30. There's nothing like a long rainstorm in the back-country to make people hoist their true colors. 31. If you don't know what to say, there's no need to open your mouth and demonstrate. 32. Being a parent frequently feels like grabbing the child's hand and leading them on a tight-rope walk between adventure and safety. Sheltering and equipping. Confidence and humility. Work and play. Independence and respect for authority. Compassion and toughness. Moms and dads tend to come down on opposite sides of these extremes. I guess that's why kids need both. 33. Faith is a journey, not a destination. When you start thinking you've arrived, you can be pretty sure you've lost your way. 34. Pride and shame are the same problem. If you are stuck looking in the mirror, focused on your own self-image, you are just as enslaved whether you like what you see or not. 35. "Struggling with sin" is a good thing. It's when we quit struggling that we're really in trouble. 36. If the scenery doesn't match up with the map, go back to the last place that looked familiar, and just relax for a while. 37. If you're going to make threats or ultimatums, you'd better be good and prepared to follow up. 38. Worship isn't just something that happens on Sunday morning. Worship has to be a way of life, if it's to be worth anything. 39. It's pretty hard to feel stressed while running up and down mountains. It's pretty hard to feel angry with a fish on. 40. You really shouldn't do yoga in a kilt. 41. When in doubt, put down the phone, turn off the computer, and get in the real world with family and friends, sunshine and wind. 42. Love people for who they are, not for what you need from them. 43. "Weep with those who weep" means just that. Sharing another person's suffering is very uncomfortable, and it is all too easy to minimize or explain away the suffering, not so much to comfort the sufferer, but to diminish our own discomfort. But consider how God deals with us in our suffering: He seldom makes it go away and he hardly ever explains it to us; he walks with us through it. He expects us to do the same for each other. It isn't supposed to be comfortable. 44. A person who has stopped learning has no business teaching. 45. Growth takes time. Learning the right way, and learning to walk in that way, is a long process. If you're a friend of mine, you've probably had to be patient with me at some point. Thanks. I'm getting there. Setting: An empty cafeteria, with a large window looking out upon a starry sky. Two armored Imperial Storm Troopers walk into the room, chatting amicably, carrying lunch boxes. They sit down and remove their helmets. NC-217 is a young, blond man in his late teens. PG-8115 is a few years older, with dark hair. They open their lunch boxes and begin to eat. 217: [Around mouthfuls of food] So, I had the craziest dream last night. 8115: [Snorts loudly] Like that's gonna happen. I'm telling you, kid, this Death Star is the key to peace in this galaxy. Once we finish welding those blast grates over the thermal exhaust ports...Nobody's gonna make trouble now. 217: [Laughing] No, no, no! I was flying a fighter of some kind and brought down an ATAT...With a HARPOON! 217: We had civilian names, too. Check this out: I was...[with exaggerated drama] Luke...SKYWALKER! 8115: [Spits coffee across table] Oh, that's beautiful! Suits you. How 'bout me? Do I get a name in this dream universe? 8115: Hmmm...I like yours better. 8115: I had my own ship? This gets better and better! 217: Yeah. The Millennium Fahlcon. 8115: [Snorts again] Well, that's more like it. Millennium Fahlcon. 217: It could make the Kessel Run in 12 parsecs! 8115: [Glances at clock on wall, stands and begins rapidly repacking lunch box] Hey, kid, we're gonna HAVE to run if we're gonna make it to target practice on time. Come on! 217: [Stands up and begins packing box] Target practice! So in this dream, you and me? Rag-tag rebels with no training? We couldn't MISS with our blasters. But the Imperial Storm Troopers? Couldn't hit anything. It was crazy--like they were missing on purpose or something. Voice from Off Stage: NC-217! Your nourishment interval ended 30 seconds ago. Why are you still here? Are you ill? 217 Quickly finishes loading lunchbox, looks out window again, heaves a deep, regretful sigh...then grabs helmet and rushes off stage. Those who claim to know say today is the first day of Winter. Those of us who live in northern climates, who have been bundling up and plugging in our block heaters for a couple months now, often get a good laugh out of that. I went outside early this morning to do a couple quick chores. Early: Still dark, the stars still burning, the blue-silver just starting to touch the eastern horizon. And I could smell magic crackling in the cold air. Not goofy, Harry-Potterish, turn-kittens-into-mushrooms magic, nor fluffy, New-Ageish, dance-barefoot-in--the-rain magic, but the kind of magic grounded in hard science and certain hope: Today is four seconds longer than yesterday. Today, the sun begins its journey back north. First day of Winter? Heck no. Today, Spring starts coming. It takes a long time, and there are still storms to endure, but it's coming, and nothing will stop it. Sometimes it’s painful to turn on the news this time of year. It seems like there is something about the Christmas season that brings out the worst in people. Or maybe the selfishness that is endemic to humanity is thrown into sharper contrast against the ideals of “Peace on earth, good will toward men.” Sometimes it seems as if the whole season is nothing but greed and guilt, disillusionment and broken dreams, wrapped up with a pretty ribbon. But sometimes, things work out just like they should. Sometimes, the simple kindness of a complete stranger reminds you that the Christmas spirit is alive and well, in ways that can’t be bought with money. This story, told in the emails below, is about Christmas. Enjoy. I have a request with a story behind it. If you aren’t in the mood for a story, feel free to skip to the last paragraph for the request. I know how busy you must be this time of year. Three years ago, my wife was very sick at P/SL Hospital, trying to recover from a burst appendix and the loss of our son (she was 23 weeks pregnant when her appendix burst), and I was staying at the Ronald McDonald house just down the road from you. Over our two-month ordeal, Sarah suffered many complications, many of them life-threatening, all them extremely painful. In addition to all that, we were separated from our then-two-year-old daughter for almost two months. It was a lonely, dark, painful time for my wife. Recently, as happens in a house full of children and animals, that baby giraffe was torn apart by a playful puppy. Sarah cried—that little stuffed animal had some serious memories behind it. It isn’t something that can be replaced, but I would like to do the next best thing. I have looked around your site and can’t find a link to your gift shop, which makes me think that you don’t sell gifts online. Still, if it is possible, I would like to ask if you could send my wife one of those baby giraffe stuffed animals. I know I could find one online, but that wouldn’t be the same—I need one from the Denver Zoo. I would be happy to pay for it and the postage, of course, and whatever packaging fee for your trouble. Please let me know if this is possible. I can only imagine how sad your wife must have felt when the baby giraffe was torn apart. I would love to assist you in the purchase to help replace the baby giraffe. Do you know what size the giraffe was, how much it was and who the company who made the giraffe is? We have a $9.99 fuzzy giraffe from Aurora that is approx. 6 to 8 inches and I have a 12” cuddlekin that sits and neck stands tall that is $16.99. And I also have a large stuffed giraffe that is on promotion normally $30 for $17.99. Happy holidays to you and your wife Mr. Wilson! Marlina, thanks for your kind reply! I believe it was the 6-8 incher that Sarah had before. I don’t know the brand. It was very soft and sort of floppy. Do they have a Denver Zoo logo or tag on them? I want her to know it’s the real deal. Yes we have the super soft giraffe somewhat floppy and I would be happy to put a Denver Zoo Medallion and Holiday ribbon that says Happy Holidays from the Denver Zoo. Where would you like it shipped? And because of your touching story, I would love to buy it for you and your wife. Please let me know; thanks! Wow…I don’t know what to say. That is very sweet of you, and that would make it mean even more. If you don’t mind, I will have you ship it to me at work, because if Sarah sees a box from the Denver Zoo in the mail, she’ll get suspicions. No, thank you for the touching story and I am so sorry for the loss of your baby. I hope the baby giraffe helps to comfort and bring joy. I wish you both happy holidays. I am writing to request contact information for the supervisor of Marlina Schleuger, Retail Operations Manager of the Denver Zoo; I would like to inform said supervisor about a recent interaction I had with Ms. Schleuger. I have searched your website and am not sure whom I need to contact. If you could point me in the right direction, I would be most grateful. My name is Mark Kathman, and I have management oversight responsibilities for the Food and Retail Operations at the Denver Zoo. I was forwarded your email request that you submitted to our info email on our website. Let me thank you for reaching out to us—feedback (positive or otherwise) only helps us improve and work towards achieving our “EXTRAordinary” service goals. That said, it is my responsibility to receive feedback and to address accordingly. Please feel free to contact me at your convenience to share. Thank you for contacting me so promptly. Far be it for me to tell you how to do your job, sir, but you need to give this person a raise. If people like this are normal for your company, you have a remarkable company indeed. I have attached our correspondence below. Thank you for sharing this heartwarming story. I am deeply saddened for the tragedy that your family went through. As a husband and father, I was quite touched by the story—I definitely held my wife and daughters a little longer after reading this last night. And, as a man who strives to be a servant leader, I was even more touched by your story, and extremely proud of Marlina’s response. I do believe that I am part of a remarkable company, and stories like yours only validate this. With your permission, I would like to share this story with the entire company for a couple reasons: to recognize Marlina with her peers for making the extra effort and doing the absolute right thing; and also to share this as an example with all of our employees to never take any guest interaction for granted. For some, a stuffed animal may just represent a simple souvenir of a (hopefully) fun day, but to others it could represent a priceless symbol of remembrance—as is the case with your wife, Sarah. What a remarkable opportunity we would have to utilize this as a mechanism for training. Please advise if you would allow us to share. And as for Marlina—rest assured, you can bet that the recognition I mentioned above is not the only thing she will receive for this. Thank you again for sharing, and Happy Holidays to you and your family! A few days before Christmas, I received an elaborately wrapped box from the Denver Zoo gift shop. On Christmas morning, we were delighted and shocked to find not one, but three different stuffed giraffes in the box, all wearing “Happy Holidays from the Denver Zoo” ribbons. Next time you are saddened by news stories about people getting trampled in the rush for the latest fad toy, remember the kindness of a complete stranger in a big city gift shop (whom I really hope is enjoying a big raise). Remember, this Christmas season, that there are still people out there for whom “Peace on Earth, good will toward men” is not just an ideal. Remember that there are still people out there who Get It. Remember that you have a choice, every day, to be one of those people. Please leave a comment so I know you stopped by.